The caterpillars pupate in a voluminous brown cocoon. The adult moth is basically grey. Each wing has several submarginal wiggly lines the outermost being white, and the other dark. Each forewing has two white spots. 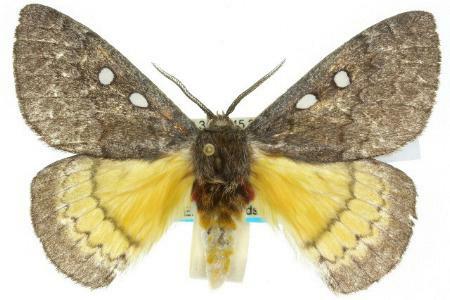 The hindwings have a large yellow basal area. The wingspan is about 6 cms. Melbourne University Press, 1990, pl. 13.11, p. 395. Volume 46 (1921), p. 179, No. 28. CSIRO Publishing, 2007, p. 156.